motors and a power supply. size:  7 cm long by 9 cm wide by 2 cm tall. cost:  $20 for the SWATCH motors, $49 for the STAMP, $5 for the rest. 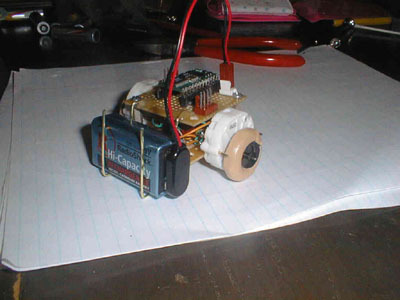 I used a shift register to actually run the motors. current to drive the motors effectively. There are two problems with using these SWATCH motors. rather quickly. The stepper motors won't move otherwise. 100 RPM. So, adding gears slows it down to a snail's pace. of the size of Fric).